"Personalized Initial and Birthstone Necklace Gold, Covey Necklace for one Child"
Who is in your sweet family covey? This mother's birthstone necklace for the mother of one has one birthstone and an initial charm. The initial pendant is custom stamped with your family initial. Our signature lavender and rosebud packaging is available. This unique mothers birthstone necklace for the mother of one comes with one birthstone and an initial charm. You can add more birthstones to represent other members of the family for only $10 each. Every coveted member of your family can be represented on this lovely necklace. Garnet, amethyst, sapphire and rubies are just a few of the teardrops stones used to signify the birth months. A script initial charm is stamped with the last name initial and then surrounded by the stones of each child and parent. We think it is a simple yet stylish way to keep your family with you at all times. 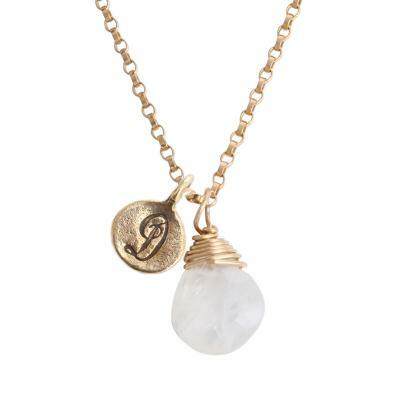 Please note: The price listed is the base price for a gold filled necklace with an initial and one stone. Each additional stone is $10. Gold chain and wire is gold filled. Gold charm is gold vermeil ~ 14K gold over sterling. Initial charm is approx 1/2". Stones vary in size but average 3/8" in height. Stones are as pictured but may vary in color slightly.